Jagjit Singh, born Jagmohan Singh Dhiman (8 February 1941 – 10 October 2011), was an iconic Indian Ghazal singer, composer and musician. Known as the "Ghazal King", he gained acclaim together with his wife, another renowned Indian ghazal singer Chitra Singh in the 1970s and 1980s. Their combination album comprising music from the films, Arth and Saath Saath is the HMV's largest selling combination album of all time. Sajda (An Offering, 1991), Jagjit Singh's magnum opus double album with Lata Mangeshkar holds the same record in non-film category. He sang in numerous languages. He was awarded the Padma Bhushan by the government of India in 2003. In February 2014, Government of India released a set of two postal stamps in his honour. Jagjit Singh is credited for the revival and popularity of ghazal, an Indian classical art form, by choosing poetry that was relevant to the masses and composing them in a way that laid more emphasis on the meaning of words and melody evoked by them. In terms of Indian Classical music, his style of composing and Gayaki (singing) is considered as Bol-pradhan, one that lays emphasis on words. He highlighted this in his music for films such as Prem Geet (1981), Arth and Saath Saath (1982), and TV serials Mirza Ghalib (1988) and Kahkashan (1991). 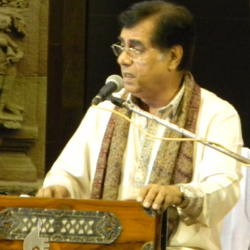 Jagjit Singh is considered to be the most successful ghazal singer and composer of all time in terms of critical acclaim and commercial success. With a career spanning five decades and a repertoire comprising over 90 albums, the range and breadth of his work has been regarded as genre-defining. He is the only composer and singer to have composed and recorded songs written by former Prime Minister of India Atal Bihari Vajpayee – also a poet – in two albums, Nayi Disha (1999) and Samvedna (2002). Singh's 1987 album, Beyond Time, was the first digitally recorded release in India. He was regarded as one of India's most influential artists. With sitar legend Ravi Shankar and other leading figures of Indian classical music and literature, Singh voiced his concerns over politicisation of arts and culture in India and lack of support experienced by the practitioners of India's traditional art forms, particularly folk artists and musicians. He lent active support to several philanthropic endeavours such as the library at St. Mary's School, Mumbai, Bombay Hospital, CRY, Save the Children and ALMA.